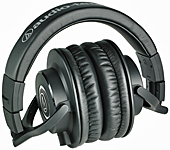 "Audio-Technica has raised the bar once again ... and this time they've raised it quite a bit. Already these phones are by far the favourite in our studio." - George Massenburg - GRAMMY winning engineer & producer. With the ATH-M50 and ATH-M50x (pictured) professional studio monitor headphones, Audio-Technica has achieved an exceptionally accurate response and long-wearing listening comfort. Designed especially for professional monitoring and mixing, these studiophones feature an efficient collapsible design for space-saving portability and storage. Circumaural ear pieces swivel 180° for easy one-ear monitoring and luxuriously padded ear cushions create an outstanding seal for maximum isolation. The adjustable headband is generously padded for ultimate comfort during long mixing sessions. The ATH-M50 has a coiled cable at the left earpiece terminates to a gold-plated mini plug with included screw-on ¼" adapter. The ATH-M50x (pictured) features the same coveted sonic signature as the ATH-M50 but comes with with even more refined earpads and three detachable cables - a coiled and two straights - for every situation. Audio-Technica’s sophisticated driver technology and superior components deliver exceptional power handling and very high SPL capabilities while maintaining clarity of sound throughout their extended range, with deep, accurate bass and outstanding high-frequency extension. The headphones feature propriety large-aperture drivers with neodymium magnet systems for ultra-efficient signal transfer. The high-performance ATH-M40x professional headphones are tuned flat for incredibly accurate audio monitoring across an extended frequency range. Your studio experience is enhanced with superior sound isolation and swiveling earcups for convenient one-ear monitoring. Engineered with pro-grade materials and robust construction, the M40x excels in professional studio tracking and mixing, as well as DJ monitoring.Advanced build quality and engineering. x professional monitor headphones are tuned for highly detailed audio. 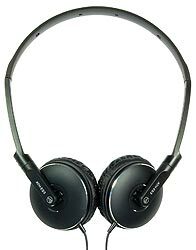 Featuring strong mid-range definition, these versatile monitoring headphones are ideal in a wide variety of situations. Designed primarily for studio tracking and mixing, they offer added features for increased portability, making them a great choice for field recording. When a pair of fully enclosed headphones are a bit big for a location job here is a perfect pair of compact, on-the-go headphones. 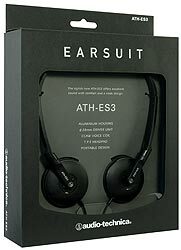 The ATH-ES3 provides adequate isolation from modest ambient noise in location environments and impressive 28mm neodymium magnets project powerful, accurate sound. The earpads swivel into the ideal listening position for a comfortable custom fit. These sleek headphones fold flat for easy storage in a briefcase or a side pocket of a bag - great for all your field recording assignments. 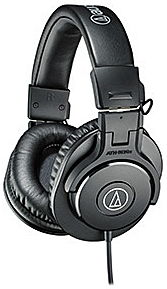 Audio-Technica's ATH-M20 (left) and ATH-M20x (right) headphones are fine for every-day non-critical use, when fully enclosed headphones are needed for good isolation, but budget is also a consideration. 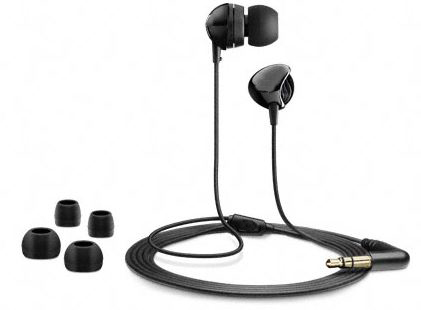 Features include: neodymium magnet structure; lightweight, adjustable cushioned headband; gold-plated stereo 1/8" (3.5 mm) connector with strain relief and snap-on ¼" (6.3mm) adaptor; ultra-flexible 3m cable with single-side exit. 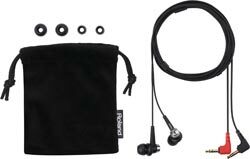 The Roland CS-10EM headphones are not your everyday in-ear headphones. They are also binaural microphones. Combining in-ear monitoring with binaural recording. Enhancing the ease and enjoyment of recording on the go, to make a great companion for virtually any of the most affordable solid state sound recorders we offer here. All you your recorder needs is a stereo mini-jack headphone socket and a stereo mini-jack microphone input socket with plug-in power. Simply connect these amazing microphone-equipped earphones to your recorder, adjust the levels and capture what you hear. Then listen back instantly. Natural binaural stereo recording at an affordable cost. Great for monitoring while recording thanks to the CS-10EM’s all-in-one design. 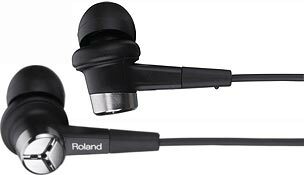 We are often asked for a pair of "cheap-but-good" in-ear type headphones to go with our lower cost solid state sound recorders. Trouble is - there's no such thing. As ever, with in-ear headphones you get what you pay for, so it's not surprising that a pair of earphones you've only paid a few quid for sound thin and tinny - no good for judging your precious recordings. That's why we've worn our ears out trying various makes and types of low-cost in-ear headphones and at last come up with a solution. Here's a pair that are reasonably priced and yet sound really very good indeed, delivering accurate top and mid as well as rich bass. Certainly good enough to use with our sub-£300 recorders, and at a price that may be more than those horrible thin and tinny ones we mentioned but is surely worth it.